For the discerning camper shopping for a new RV, the choice can be overwhelming. Scores of camper trailer manufacturers exist throughout Australia and many of the top brands offer unique features, which means finding the right manufacturer for you can take time and patience. To make the process of choosing the right camper a little less intimidating, we've put together a list of some of the key manufacturers in a handy state-by-state guide. Read on to see a list of camper trailer outlets in New South Wales. These off-road specialists offer high-quality rigs built by campers, for campers. Twice named CTA Offroad Camper of the Year. Australian-made and well-loved, the Complete Campsite team has been providing family-friendly campers since the early 1990s. Originating in South Africa, Echo has manufactured 10,000 durable and tough offroad campers to date. The largest camper trailer manufacturer in Australia, GIC is family-owned and has been in the business for around 10 years. Kimberley Kampers have been making RVs since 1996, and pride themselves on safety and offroad ability. The team behind National Campers is made up of experienced engineers with a passion for automotive design and camping. The designers of these high-quality adventure campers started out building boats. This local company has been running for 20 years. 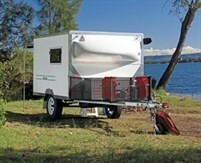 Based in New South Wales, Skamper ship their quality camper trailers to outlets across Australia. 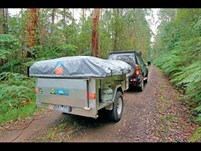 Based in Melbourne, 3 Dog Camping offer a range of trailers, roof-top campers and ute-back campers. This manufacturer of quality camper trailers is based in North Richmond, on the Hawkesbury River, New South Wales. Blue Tongue campers are known as luxury on wheels. This company offers trailers, kitchens and accessories. Cavalier Campers are a local, reliable business offering custom campers at reasonable prices. 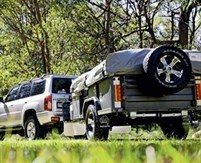 The offroad Australian-made campers from the Camel Group come with a five-year warranty. Customline stands by its claim to deliver Australian-made camper products at factory direct prices. Based in Adelaide, Challenge Campers are 100% Aussie-made, promising no cheap imports. Outback Campers has been producing high quality camper trailers since 1990. 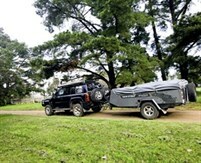 Trackabout Offroad Campers are made to last, intended for intense travel around Australia.